Most instruments are made out of wood. Wood moves and shifts with climate changes. When this happens, it can affect the way it plays. 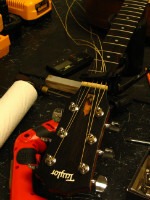 A set up will restore your instrument back to factory specs or your own personal specs. We go over every point of your instrument and make it sound and play its best. If you are a Taylor guitar owner please note that we offer most of the same care packages that the factory offers. Please ask us for details. This is a thorough point by point assessment and set up that will make your instrument play its best. The instrument is returned to factory specs or set at your own personal specs.